Why Do Mesoscale Eddies Matter? Mesoscale eddies are ubiquitous in the ocean, and typically exhibit different properties to their surroundings (Fig 2), allowing them to transport properties such as heat, salt and carbon around the ocean. For example, Agulhas eddies carry water with properties associated with the Indian ocean far into the South Atlantic. In the Southern Ocean, eddies account for the majority of oceanic poleward heat transport across the Antarctic Circumpolar Current. The water properties of eddies are also important in supplying nutrients to coastal zones and the surface ocean where plankton blooms may result. More than half of the kinetic energy of the ocean circulation is contained in the mesoscale eddy field, with the remainder largely contained in the large-scale circulation. Where Do Mesoscale Eddies Come From? The largest scale eddies emerge from instabilities of strongly horizontally sheared motions, particularly in boundary currents such as the Gulf Stream. These eddies often take the form of well defined rings extending to great depth. At slightly smaller scales, on the order of tens of kilometers, eddies are generated by the slumping of horizontal density gradients in a process known as baroclinic instability. Both of these formation processes lead to hot spots of eddy energy in the vicinity of western boundary currents and the Antarctic Circumpolar Current. Fig. 1: False color image of ocean water color, from NASA’s Aqua MODIS satellite. Image courtesy of NASA-GSFC. The circular blue in the middle left is approximately 100km in diameter. Fig. 2: Sea surface temperature from a fine-resolution (1/10° ⪝ 12 km grid spacing) from GFDL’s CM2.6 model. The view is of the South Atlantic and shows Agulhas eddies originating near the Cape of Good Hope (bottom right of image). The ocean transports heat from the tropics to the poles, helping to maintain the extra-tropical climate. How the ocean transports heat varies by region, but in many regions, including the Southern Ocean, the mesoscale eddy heat transport is the dominant mechanism. In order to understand the role of eddies in climate, GFDL has developed global climate models that include ocean mesoscale eddies. These models are computationally expensive because the grid scales required to admit realistic eddies (~10km) are very small relative to the globe. Thus far, the finest resolution ocean used in a climate model is the 1/10 degree ocean component of the CM2.6, in which case the eddies are vigorous and largely reflect the level of energy suggested from satellite sea surface height measures. In addition to their role in moving heat poleward, mesoscale eddies effect a vertical transfer of heat in the ocean, largely moving heat upwards to partially compensate for the downward heat transport by time mean fields. This vertical heat transport makes mesoscale eddies somewhat of a “gatekeeper” for ocean heat uptake, in which heat that otherwise could enter the deep ocean through mean circulation processes is in fact returned to the surface by transient mesoscale eddies. An accurate representation/parameterization of this vertical heat transport process remains an ongoing research aim at GFDL. Do Eddies Affect Sea-level Change? Steric sea-level change arises from changes in ocean density, which arise from changes in temperature and salinity. Questions about sea level change are largely split into global and regional questions. Global sea level rise occurs when the ocean warms, whereas regionally sea level changes due to the movement of heat and salt locally impacting on steric sea level patterns. For example, the ocean’s heat budget is sensitive to a balance of processes in regions where the ocean cools, many of which are known as deep-water formation sites. Such cooling at the ocean surface often results in the release of heat from the ocean interior, and in turn modifying sea level regionally. In these “open-ocean deep-convection” sites, eddies play an important role in controlling the depth of convection by fluxing heat from the interior into the convection site. Additionally, possible changes in the Gulf Stream associated with a reduced Atlantic overturning circulation may give rise to local sea level rise along the US Atlantic coast, with details of such changes requiring models of resolutions sufficient to represent the ocean mesocale. Finally, the interactions between the ocean and land ice shelves occurs on very fine scale at high latitudes, with such interactions potentially impacting the stability of ice sheets and so represent perhaps the most important unresolved question in sea level studies. Each of these issues are being actively pursued as part of GFDL’s studies of sea level. Most ocean climate models have a horizontal grid-spacing that is too coarse (typically 1° ⪝ 110 km) to explicitly represent any but the very largest eddies. Even in newer climate models the grid-spacing (typically ¼° ⪝ 30 km) is said to be only “eddy permitting”. 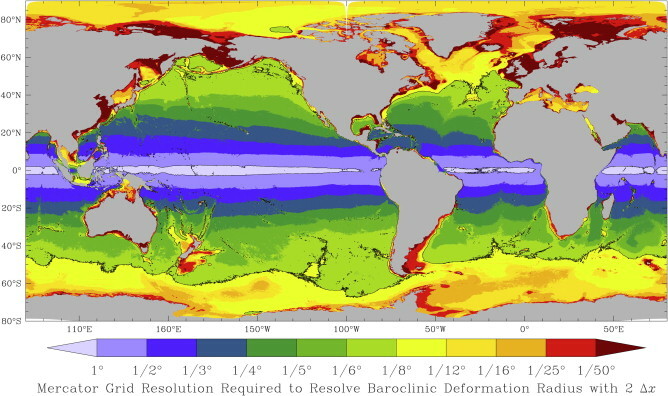 Only in our finest resolution models (grid-spacing of order 1/10° ⪝ 12 km) do we consider the largest baroclinic eddies to be resolved, and even then, only in some parts of the ocean. In all these models, the important effects of the unresolved eddies must be parameterized – represented in terms of large-scale gradients of density or velocity. Griffies, Stephen M.,Michael Winton, Whit G Anderson, Rusty Benson, Thomas L Delworth, C O Dufour, John P Dunne, P Goddard, A K Morrison, Andrew T Wittenberg, J Yin, and Rong Zhang, February 2015: Impacts on ocean heat from transient mesoscale eddies in a hierarchy of climate models. Journal of Climate, 28(3), doi:10.1175/JCLI-D-14-00353.1. Jansen, Malte, and Isaac M Held, August 2014: Parameterizing subgrid-scale eddy effects using energetically consistent backscatter. Ocean Modelling, 80, doi:10.1016/j.ocemod.2014.06.002. Hallberg, Robert W., December 2013: Using a Resolution Function to Regulate Parameterizations of Oceanic Mesoscale Eddy Effects. Ocean Modelling, 72, doi:10.1016/j.ocemod.2013.08.007. Delworth, Thomas L., Anthony Rosati, Whit G Anderson, Alistair Adcroft, Ventakramani Balaji, usty Benson, Keith W Dixon, Stephen M Griffies, Hyun-Chul Lee, Ronald C Pacanowski, Gabriel A Vecchi, Andrew T Wittenberg, Fanrong Zeng, and Rong Zhang, April 2012: Simulated climate and climate change in the GFDL CM2.5 high-resolution coupled climate model. Journal of Climate, 25(8), doi:10.1175/JCLI-D-11-00316.1. Griffies, Stephen M., and R J Greatbatch, July 2012: Physical processes that impact the evolution of global mean sea level in ocean climate models. Ocean Modelling, 51, doi:10.1016/j.ocemod.2012.04.003. Farneti, Riccardo, Thomas L Delworth, Anthony Rosati, Stephen M Griffies, and Fanrong Zeng, July 2010: The role of mesoscale eddies in the rectification of the Southern Ocean response to climate change. Journal of Physical Oceanography, 40(7), doi:10.1175/2010JPO4353.1. Marshall, D, and Alistair Adcroft, April 2010: Parameterization of ocean eddies: Potential vorticity mixing, energetics and Arnold’s first stability theorem. Ocean Modelling, 32(3-4), doi:10.1016/j.ocemod.2010.02.001. Hallberg, Robert W., and Anand Gnanadesikan, 2006: The role of eddies in determining the structure and response of the wind-driven Southern Hemisphere overturning: Results from the modeling eddies in the Southern Ocean (MESO) project. Journal of Physical Oceanography, 36(12), 2232-2252.